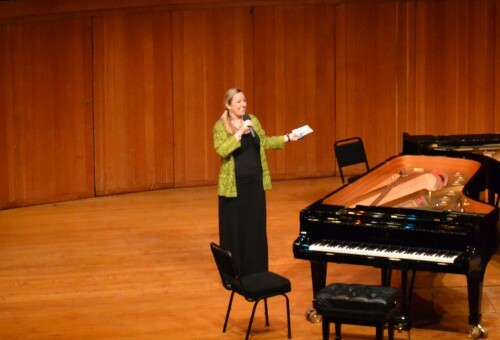 Cape Town Concert Series manager Louise Howlett introducing 3 Pianos! Coming up with new ways to perform music that is usually at least a hundred years old, is perhaps the biggest challenge for modern classical musicians. On one hand is sheer performing brilliance, but although impressive, accelerating the tempo to show off technique often loses the essence of the work – many pianists are accused of “machine-gun fire” and wrecking Rachmaninov’s 2nd or 3rd piano concertos. On the other hand is the interpretation of the work in a new or creative way, and this carries an even heavier risk of losing the plot entirely and venturing into the realm of the ridiculous – giant-head costumes for Wagner’s Ring, pregnant fairies for Mendelssohn’s Midsummer Night’s Dream, Romeo and Juliet with guns and car chases, etc. 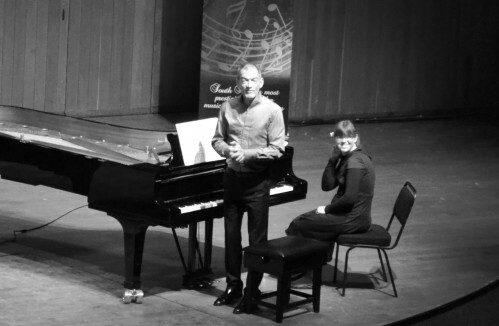 Creating a new performance concept is an admirable skill, and it should be acknowledged that last Saturday’s Cape Town Concert Series managed by Louise Howlett, struck gold. For the first time ever in Cape Town, three of our grandest pianos shared the stage with three of our most accomplished pianists, giving the evening a “Three Tenors” ambiance, were the audience is pleasantly overwhelmed by the feeling of being in the presence of stars. Judging by the audience high in the interval and after the concert, I hope to see a repeat of Albie van Schalkwyk’s memorable arrangements for three pianos very soon. What a way to open! 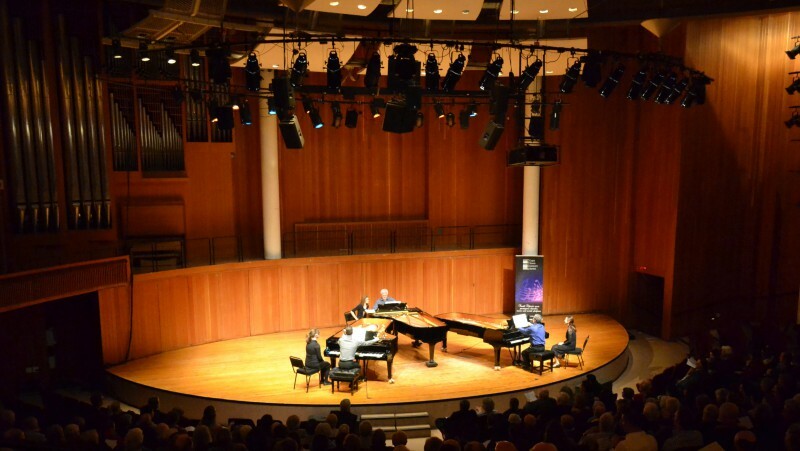 With a bang, we were swept into the show by all three pianists in a perfectly synchronised performance that established a central theme of the concert: excitement! And what a rich, wonderful sound from these three pianos in the equally shared virtuosity of van Schalkwyk’s score. There were no accompanists, just well-distributed bursts from each in turn, that accelerated and embellished the romantic fantasy of Bernstein’s work. Continuing the upbeat spirit of fun, at times becoming a roller-coaster, was the constant dialogue between the voices. I was reminded of the gorgeousness of this instrument, and how, for someone who loves the piano, this concert was a festival of familiar works and lush washes of sound. Adding to an excitement was the “mad hatter tea party” approach – the performers changed places for each work on the program so that they took turns facing the audience (while at the same time identifying the piano on the right as having the brightest sound.) It was as if three magicians were weaving this symphony together. I was only later pleased to see that the final work in the concert was Dukas’ Sorcerers Apprentice! Becoming accustomed to the high energy of the concert, I developed a deeper appreciation for van Schalkwyk’s incredible arrangements, particularly in this work. The wonderful relaying forte voices somehow seemed very natural on three pianos, almost as if Prokofiev invited this exact exploration of his symphony. I felt that as a pianist, Prokofiev would have delighted in this arrangement very much. In fact I enjoyed this part of the program so much that I played the symphony on FMR the next day, but even in the orchestration one has less of the relay effect where another piano takes over the melody or a repeat of a theme, using the different colours and brightness of each piano to create modulations that are different in an orchestra. Not surprisingly, Deon Irish put it rather well in a conversation during the interval using a photography metaphor, where the three-piano arrangement is like black and white, and the orchestration is like colour. In a black and white photograph we can often notice detail in the subject, that we could have missed in the colour version, being distracted by all the prettiness. In the program notes, Van Schalkwyk quoted from Poulenc’s instructions to the pianists: to play “as if improvising it, a cigar in your mouth, and a glass of cognac on the piano… you can never use too much pedal.” Although this refers to the first of the two pieces, these deliciously scrumptious, care-free works lent a languid and loungey atmosphere to the evening, provided a relaxing oasis with all the flavour of the composer’s time. Hearing the work of another composer-pianist arranged in this way renewed for me the feeling of hearing the original form. Such is the beauty of the instrument, as far as piano-lovers are concerned, that many are of the opinion that some works are better left in their original piano version, like Mussorgsky’s Pictures at an Exhibition. As with the Prokofiev symphony, hearing this arrangement I wondered – if the spirit of these great composers could somehow hear us and attend our performances, what would they think? I, for one, see no risk here! I think Ravel would have loved it! The three-piano arrangement enters a higher orbit when exploring impressionism and the creation of colour using sound – the piano invites such rich deep fullness in its gloved percussive suspending strings – why not have three? Being greeted after the interval by samba, blues, ragtime, and then hard rock, cued my recurring realisation that this concert is amazing! It’s hard-as-nails serious technique, and at the same time fun for the whole family, with the ragtime / waltz conjuring images of Scot Joplin jamming with Tchaikovsky – I wanted to go again before the ride had finished! What an awe-inspiring experience we witnessed that night. Hardly believing it, we watched breathless as Goethe’s story unravelled deeper and deeper into complexity and chaos. In a somewhat terrifying comedy of errors, the apprentice loses control of a spell that he casts, with pandemonium resulting. This surely must be one of the most juicy challenges for any conductor – to create the appearance of mayhem with out actually losing control, and the three magicians I saw earlier playing the Prokofiev symphony, each a conductor of his own piano, immersed themselves in this challenge to serve an incredible, passionate, accurate, ground-shaking performance with all the mastery of the sorcerer in the story they were relating. Van Schalkwyk’s arrangement was stunningly virtuosic for the three pianist / magicians, an absolute delight to hear – a truly magnificent feat! Perfectly placed, this exotic favourite summed up and celebrated the theme of the concert – excitement! I like encores that feel like after-parties, as if the performers are just letting off steam. And so it seemed, easy enough in the beginning, although some way into this work it became apparent to me that there is far more to this Chabrier pop song than meets the ear. The high contrast black and white of the three pianos revealed brilliant technical skills and hidden melodies that I had completely missed in all the times I have heard this work. So in many ways, the encore was a microcosm of the macrocosm, rather nicely and holographically summing up the entire concert. 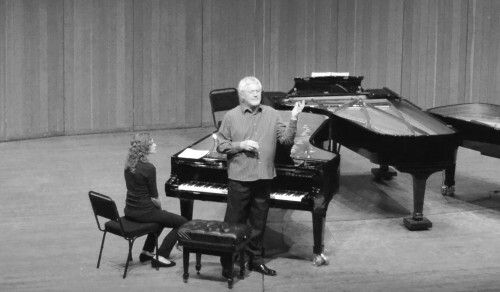 This entry was posted in Classical Music Review, Concert Review and tagged #AndyWilding, #ClassicalReview, #ConcertReview, Albie van Schalkwyk, Cape Town Concert Series, Francois du Toit, Franklin Larey, Louise Howlett. Bookmark the permalink.